I've had this idea floating around in my head for some time now but before I get into the deep dark secrets of measuring systems, I'd like to tell you a story. It all started earlier this summer while I was helping to renovate an old, outdoor cedar deck. During the demolition phase I kept noticing these holes in the railing and on some of the deck boards. The holes were random, but so perfectly round and even that I assumed someone had drilled them. It wasn't until I heard a buzzing sound coming from inside one of the boards that I caught the culprit making the holes: the humble carpenter bee. I was stunned by the consistency of these holes (it really doesn't take much to impress me). Each one was made by a different bee, yet they looked machined and exactly the same. Beeing the ever curious thinker that I am, and getting bored with all of this demolition (sorry I'm just abuzz with puns right now! ), I gathered a few boards that had holes in them and measured each one. 3/8" exactly. Every. Single. One. Perfectly round, and within 1/64" of eachother - better tolerances than most machines. It was then that the idea hit me. Is it a coincidence that our system of linear measurement (the Imperial System) perfectly describes this act of nature? Are all measurement systems so well in tune with the world around us? Is there a perfect system of measurement? The OG woodworker....the mighty carpenter bee. Just to be clear, during this article when I reference a system of measurement I'm talking about linear measurement only (inches, feet, centimeters, kilometers, etc.). As is common with humans, we have a need to understand things. We analyze, we categorize, we systematize...pretty much anything ending with "ize" we do. It's this innate desire to uncover the secrets of the world around us that drives us to develop consistent patterns. In this case, the patterns became systems of measurement. We've been doing this since ancient times and more often than not, the basis for our measurement systems has been something that we're all familiar with: our body. The Bible mentions several measurements used by the ancient Hebrews and many of those (the fingerbreadth, handbreadth, span, and cubit) were based on the proportions of the human body. The Greek Daktylos ("finger") was about 3/4", while the Pous ("foot") was surprisingly close to our own 12" ft. Speaking of feet (not usually a great conversation starter), even as "recent" as the middle ages we were still using the body as the basis for many of our measurements. At one point a yard was determined by the size of a man's waist...yikes. Many animals like horses and donkeys are still measured using a "hand" roughly equal to 4 inches. As time went on, however, our societies grew more complex. Commerce, travel, and science progressed and we required more exacting and universally accepted standards of measurement. It was during this period that we started looking to nature for those all too recognizable patterns. So we went with what we knew best...crops used to make beer. "Fourteenth-century statutes recorded a yard...of 3 feet, each foot containing 12 inches, each inch equaling the length of three barleycorns", states the Encyclopedia Britannica. Proposals like these continued for centuries, but time after time they were found lacking. The need arose for a system that could be easily replicated anywhere in the world, used proficiently in business and the sciences, and could be based on universal standards that everyone could agree on. It was this driving need for standardization on a global scale that brought about the Metric System. They gave us the croissant, the Eiffel Tower, and in 1799 the Metric System. The defining characteristics of this system are the use of the now familiar base 10 or decimal system (.001, .01, .1, 1, 10, 100, 1000, etc. ), prefixes that denote those multiples (deka, kilo, centi, milli), and most importantly a basis of measurement that was unchanging and universally accepted: the meter. Defined as " one ten millionth of the distance between the North Pole and the Equator through Paris", the meter could be measured from anywhere in the world and found to be exactly the same . They had done it. The French had found a system of measurement that would bring us out of the dark ages and into the future! They had found the perfect measurement system...or had they? Before you send the confetti flying and let loose the tears of joy, let's consider some of the drawbacks of the Metric System. While revolutionizing the sciences and engineering through its clear, concise, and easily repeatable decimal system, its major flaw lies in the very base it's rooted in - 10. More specifically, the limits it places on performing fractional arithmetic, and visually representing ratios. You're scratching your head aren't you? It will all make sense, I promise! For example, imagine a circle. Now divide it into two equal sections. Each piece represents 1/2, or as a decimal, 0.5. Now take that same circle and divide it into 3 equal pieces. In this case each piece represents 1/3, but in decimal form this would be 0.333333333333....(the three's go on infinitely). What happened here? Well, because of the base 10 only numbers that end in multiples of 2 or 5 (the only divisors of 10) will have a finite representation in decimal form. Let's repeat the previous example but this time substituting the circle for Imperial measurements (linearly speaking, it's base 12 not base 10) and see what the results are. Take a yard and divide it in half. You get 18 inches. Take the metric equivalent, the meter, and do the same thing. You get 50 cm. Again, this works because the divisor, 2, is a multiple of both 10 and 12 so you get a rational number. Now try dividing by three. The yard becomes 12 inches. The meter however, becomes 33.3333333....cm. Due to the base 12, which is divisible by 2, 3, 4, and 6, the ability to represent a large number of common fractional ratios easily and precisely is greatly increased. This is beneficial because being able to rationally visualize whole number ratios has been the basis of our design for millennia! Check out my previous blog on the The Golden Ratio for a little more on that topic. However, where the Imperial System seems to come out a winner in this regard, it's found wanting in its complete lack of consistency. In Metric you have 10 mm per cm. There are 100 cm per meter, and 1000 m per kilometer. Pretty basic, and incredibly intuitive. The Imperial System divides an inch into 1/64, 1/32, 1/16, 1/8, 1/4, and 1/2. Definitely not intuitive. Then, there are 12 inches per foot, 3 feet per yard, and...1,760 yards in a mile (I had to Google that one). So what's the point of all of this? Is there a perfect system of measurement or not?? Well, to be honest...no. Remember the story of the perfect hole made by the carpenter bee? I was stunned that it matched the Imperial measurement of 3/8" so precisely. Truth be told, it also matches the Metric measurement of 10 mm just as closely. Each system here has its merits as well as its drawbacks. What's important is what you're measuring, how it can most clearly be represented, and what you're most comfortable using. For me, growing up in the United States, I tend to gravitate towards the Imperial System for linear measurement. Although, lately I find myself often abandoning all traditional measurements and using simple ratios combined with visual instinct to help aesthetically balance my work because let's face it, the only "perfect" measurement is the one that looks right to your eyes. Just a few more goodies for you math nerds! Are fractions more precise than decimals? 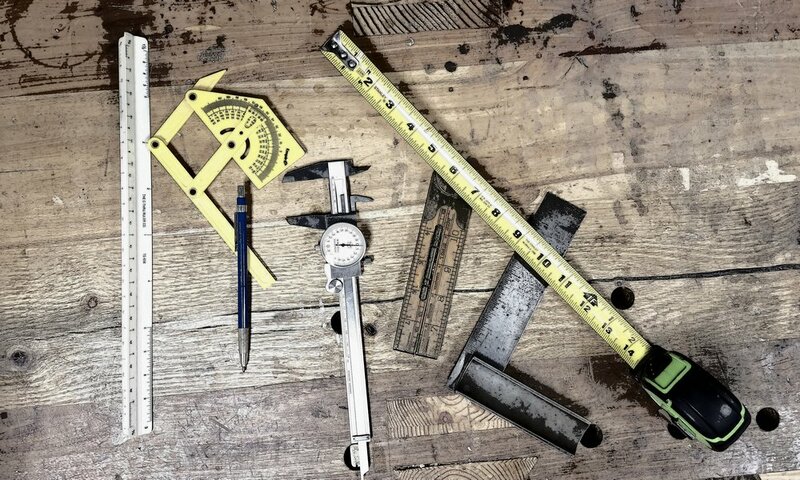 Here are a few of my favorite measuring tools to add to you arsenal!